You shouldn’t be looking at this image. Or, more precisely, I shouldn’t be showing you this image. Most of my images are made on the street, in the city. I will never forget this shot because of the reaction of this man when he noticed I had included him in my composition. Usually when people feature in my work they are figures or shapes, perhaps giving scale to a scene or becoming a dynamic element within the balance of a static composition. A person in my shots will be anonymous really and so I don’t feel the need to seek permission. 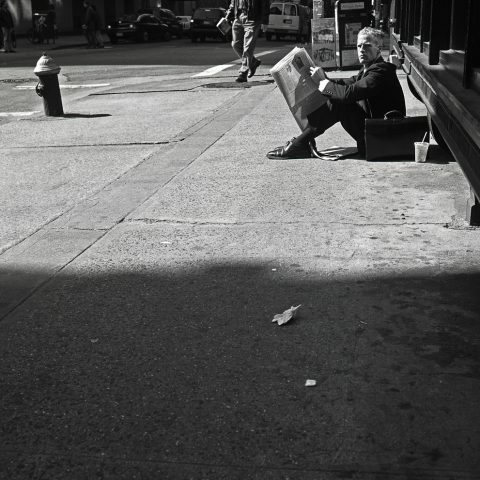 On this day in New York in 2000 I had noticed this very smartly attired businessman sitting on the ground, in a patch of harsh sunlight, engrossed in his newspaper. Something about his pose caught my eye and from a distance I took a couple of shots and then on the third click of the shutter, this shot, he turned and spotted me. The ‘prey’ had spotted the ‘hunter’. In a flash he was in my face and angrily protesting that I could not take his picture and that I must never show it to anyone. I remember being shocked at the intensity of his reaction and I had to firmly hold my ground when he demanded that I tear the film out of my Hasselblad and destroy it. There was no way I was going to agree to that so I managed to persuade him that I would never exhibit the image. As he walked away I was left spinning – in my mind I created a fictional reason for his wrath – was he hiding something? Did he have a secret identity that my image might threaten? I will never know his reasons and I remember clearly that in that moment to have asked him would have been impossible – it felt like his life depended on it. Why would someone be so threatened by photography? Over many years as a photographer I have occasionally met opposition to my camera and one of the ways I form an impression of a city and its people is by how welcoming they are to a visiting street photographer. But I have never been challenged as intensely as this and that is why I will never forget this shot. I don’t even think it is especially strong and probably would never have exhibited it anyway but it has been interesting to have this opportunity to present it and in a way assert my right to present it. This is the first time I have ever looked at it bigger than contact sheet size and even now, all these years later, I feel a pang of guilt about showing it to anyone, breaking that promise I made in the heat of the Manhattan sunshine.